In this video, we are going to divide radical expressions. If the expression has a radical in the denominator and a rational number in the numerator, then it is necessary to rationalize the fraction. 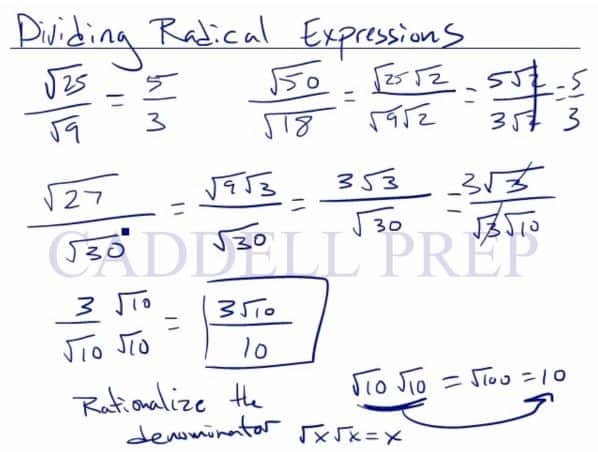 Let’s go over how to divide radical expressions. And there’s not much to do. In this case, will be cancelled out. Of course, not all is going to work out like this. This is how far we can go as far as the radicals are concerned. But this is not our final answer. Because we don’t want a radical in the denominator. But even more so, we can reduce this. Here, is going to cancel out. Now, we want to rationalize the denominator. The trick in getting rid of is to multiply the numerator and denominator by the same number. Now, let’s look at some more. Now, we don’t want a radical in the denominator. We have to rationalize it. So let’s multiply the numerator and denominator by . This is a correct way to solve it. Any way you solve for the correct answer is a good way to do it. We can reduce this right off the bat. Two different options to solve the same problem. We have the same answer both ways.